Not all vines are climbers and this amazing Clematis makes its way sprawling through life. All the better to display the masses of nodding small deep blue/purple flowers. The fluted petals are a lighter blue/ivory on the interior. Blooms non-stop from May to frost. Exhausted canes can be cut back midseason and regeneration and bloom is rapid. Wonderful 6′ tall clamberer that can find a home in large shrub or over the top of robust plant. Prune hard in early spring to the two buds just above soil level. Regular water through summer in rich, well drained soil. 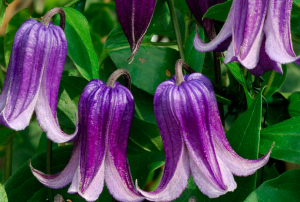 Clematis do best when given a good start in life. Double dig the soil in a large circle around the intended home. Amend the soil with liberal amounts of organic fertilizer. A demure little cut flower. May be adhered to vertical supports. Does not form modified petioles to attach. This vine is very light and will seldom squash less sturdy plants. Decorate a Juniper hedge or spangle a Philadelphus. Light deer resistance.